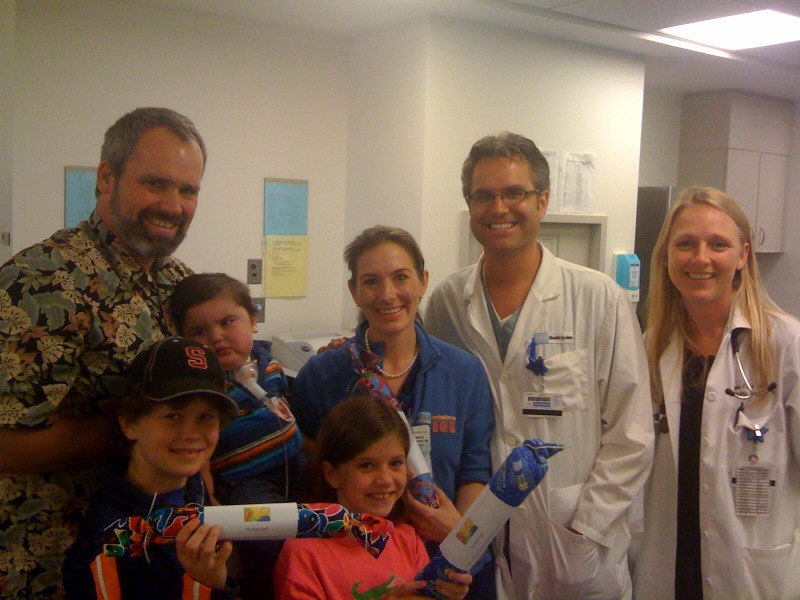 Yesterday’s visit to UCLA for our regular check-in with Rudy’s pulmonologist took us back to that reality with Rudy that you wait and wait and wait to almost a standstill and then when things move, you feel like you’re running out of the gate in a sprint. Yesterday’s consult was full of great news but I think Rolf and I both left with our heads spinning a bit. Dr. Pornchai seemed pleased with Rudy’s progress…at 30 lbs 9.4 ounces, he remains in the 90th percentile for weight but has grown in height (32 inches) putting him just under the 50th percentile (up from 20th percentile in April). Rudy’s still a chunk but at least he’s getting longer and growth in general is an indicator that his lungs and heart are working together. Although we won’t know for sure what is going on in his lungs until the heart cath in the fall, the fact that his oxygen sats are baselining a bit higher in the high 70s – low 80s…and even reached into the 90s (!) is another indicator that the lungs and heart are communicating!!! Bottom line…it’s encouraging eventhough there isn’t alot of specific information yet. As a result, Dr. Pornchai recommended we decrease Rudy’s oxygen rate to 1 liter during the day and keep it at 5 liters at night and he reduced the dosage of one of Rudy’s respiratory meds but the most surprising recommendation was to pursue “decannulation” a.k.a. “pull the trach!!!!!”. 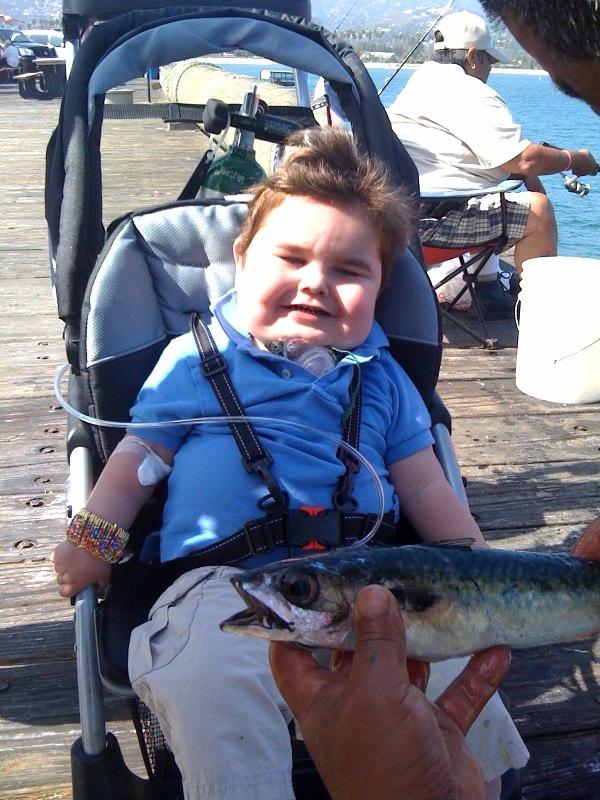 The trach has served two purposes…to help make it easier for Rudy to breath and to allow us a way to clear Rudy’s secretions for him. 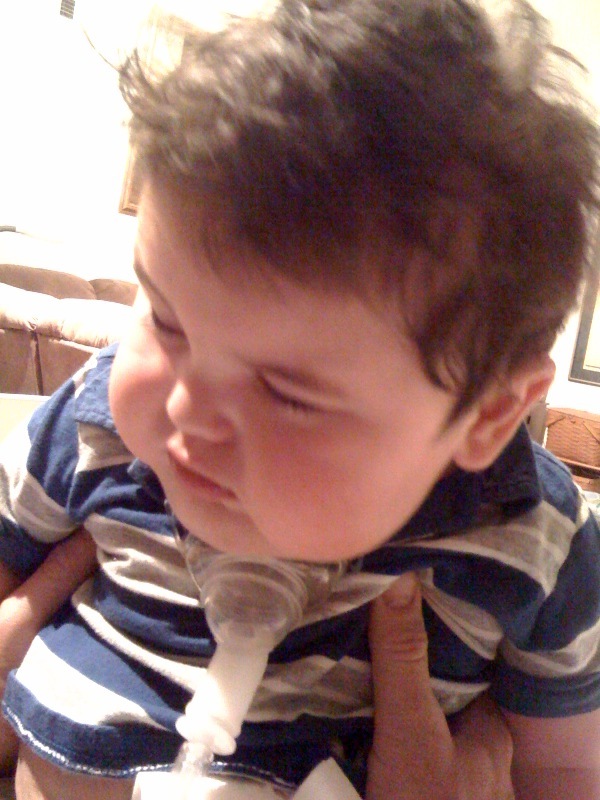 Although Rudy has become less dependent on the trach for his breathing for a few months now, we’ve needed to suction him pretty regularly up until just a couple of weeks ago…now that the need for suctioning is decreasing, there’s less and less reason to keep the trach. 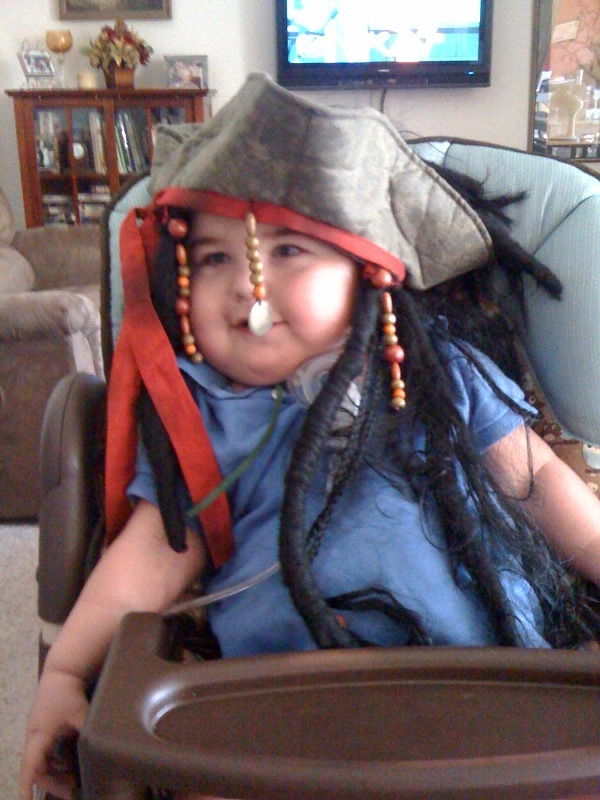 One would argue that since we are heading into another major surgery, it would be advantageous to keep the trach because it makes it easier to put Rudy on and off the ventilator (and much more comfortable for Rudy as opposed to being intubated). This is true but the trach is also a potential source of infection that many on his team would like to eliminate before heading into surgery. 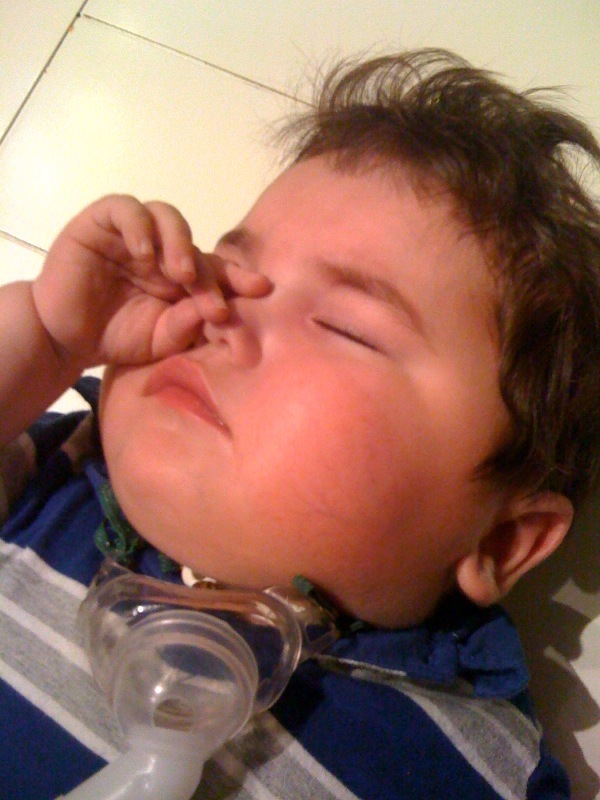 It’s funny…Rolf and I remember feeling pretty devastated when Dr. Rick told us we had reached the point in Rudy’s care where the tracheostomy was necessary and now that we are presented with the recommendation to wean him from it, our first response is “Are you sure you want to do that?”…the trach has gone from something we feared to a safety net. It is exciting, though. It won’t happen right away…Dr. Pornchai wants to talk with Rudy’s cardiology team and get a “thumbs up” from them before we proceed…we also need to schedule a “bronchoscopy” to get a good look at the inside of his airways…a procedure we’ll need to schedule with his ENT at UCLA. 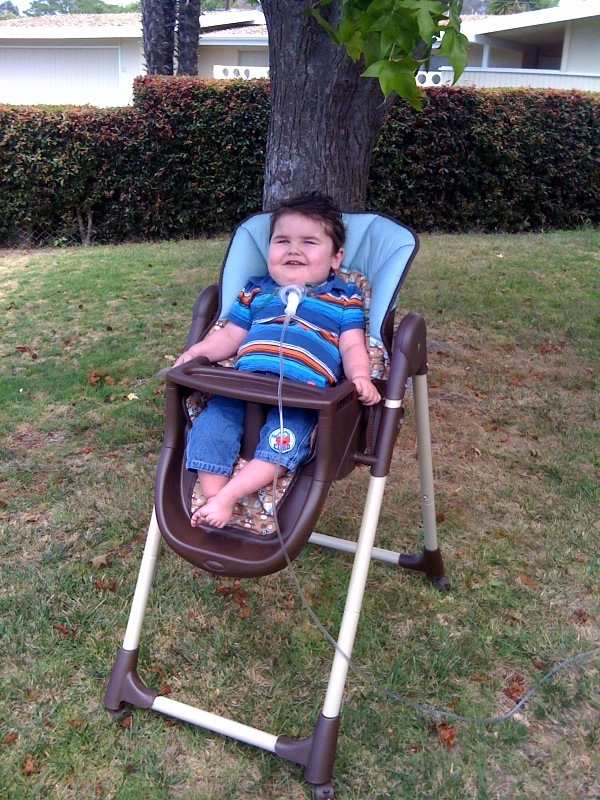 And finally, Dr. Pornchai wants to send us to Children’s Hospital Orange County for a sleep test where they will block the trach and observe Rudy overnight. I imagine it will take time to get all this scheduled but the fact that we’re even talking about going in this direction is amazing. It feels like all the progress we’ve been reporting in recent weeks is the fruit of this extended wait for the Glenn. 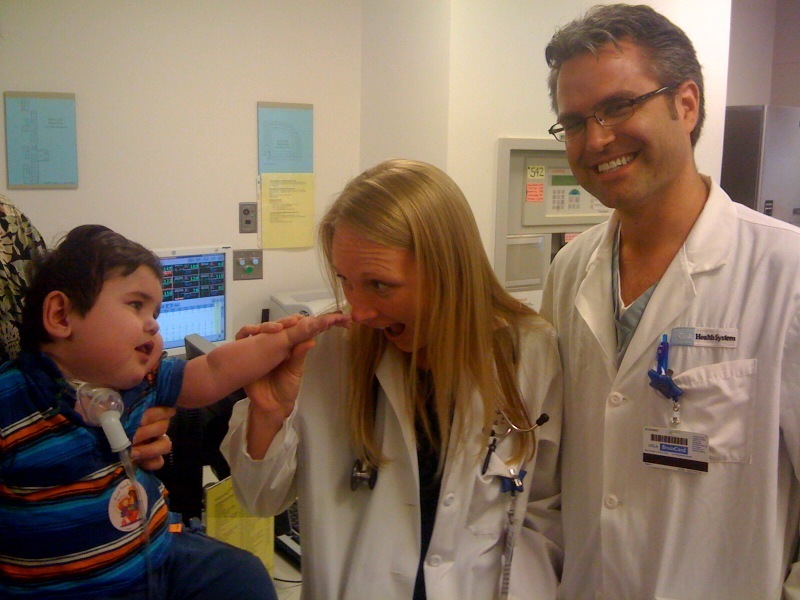 Rudy can't resist going for Dr. Myke's nose...Dr. Leigh's is out of reach! We can’t ever leave that unit without a deep sense of admiration and gratitude for the people who staff it. 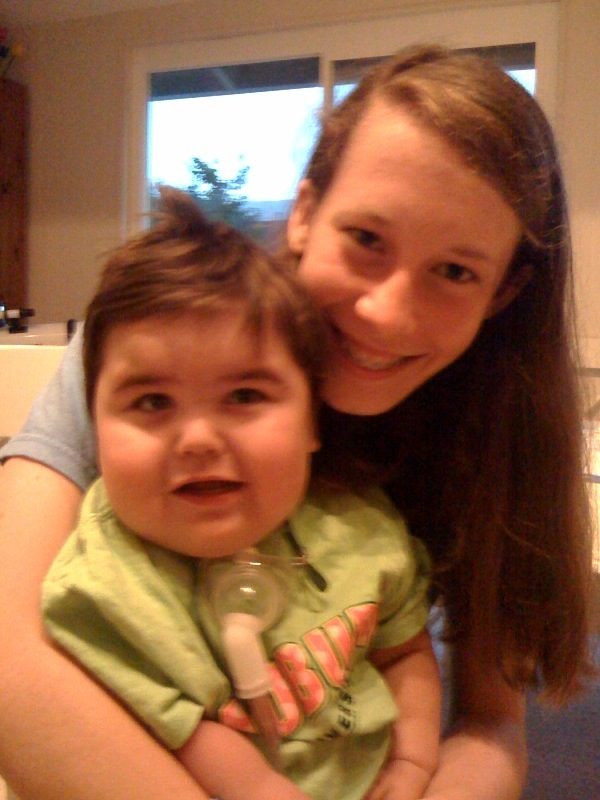 Our special day concluded with an extra-special visit with new friends…Megan and her family have been faithful Rudy’s Beat followers since a mutual friend told them about Rudy at the start of his journey. We have known about them and their commitment to pray for Rudy all these months but yesterday we had the opportunity to meet and what a sweet time it was. 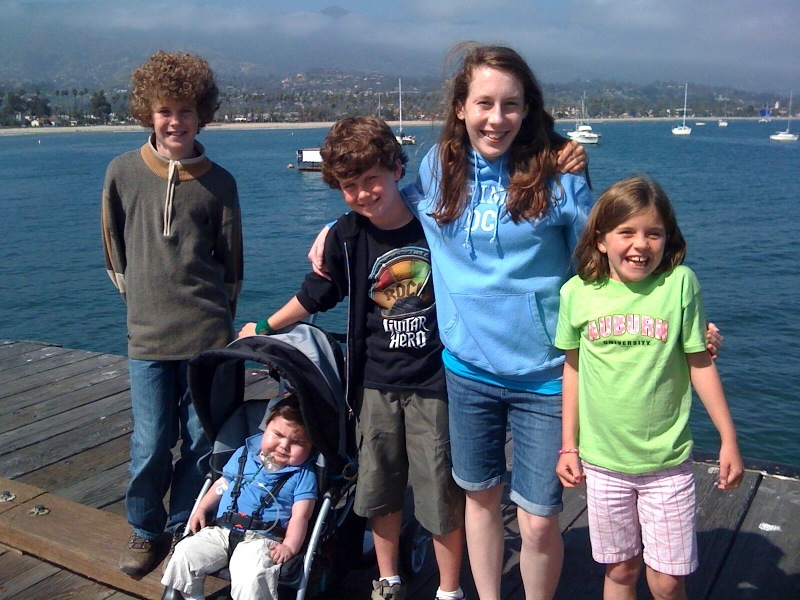 Our mutual admiration and commitment to pray for each other’s family runs deep as Megan is in her own battle for survival after being diagnosed with an inoperable brain tumor. Watching Megan and Rudy look at each other (both having very expressive eyes) was one of those “holy ground” moments for me. Please join us in praying for Megan and her family as they navigate their journey with grace and faith. Life is SO MUCH more than what we see in the here and now…everything about yesterday was a BIG reminder of that!! 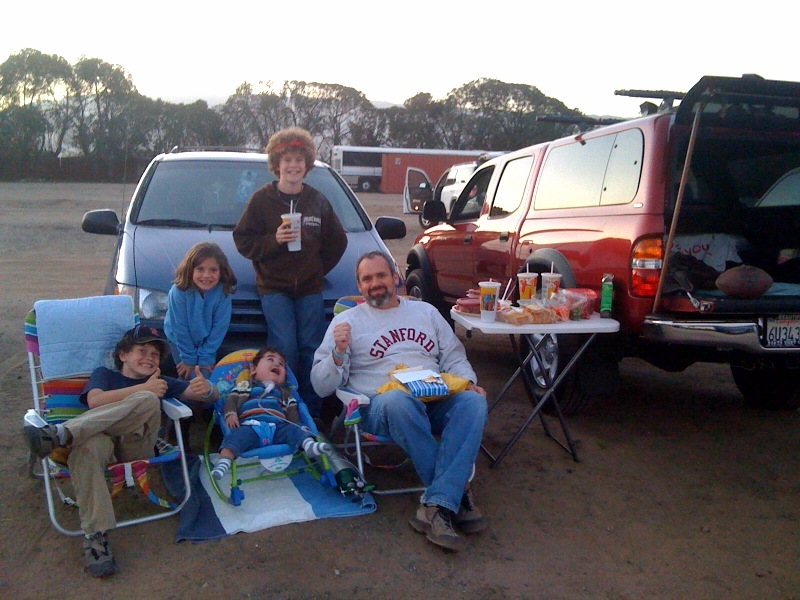 Tailgate movie party complete with snack table and presents! 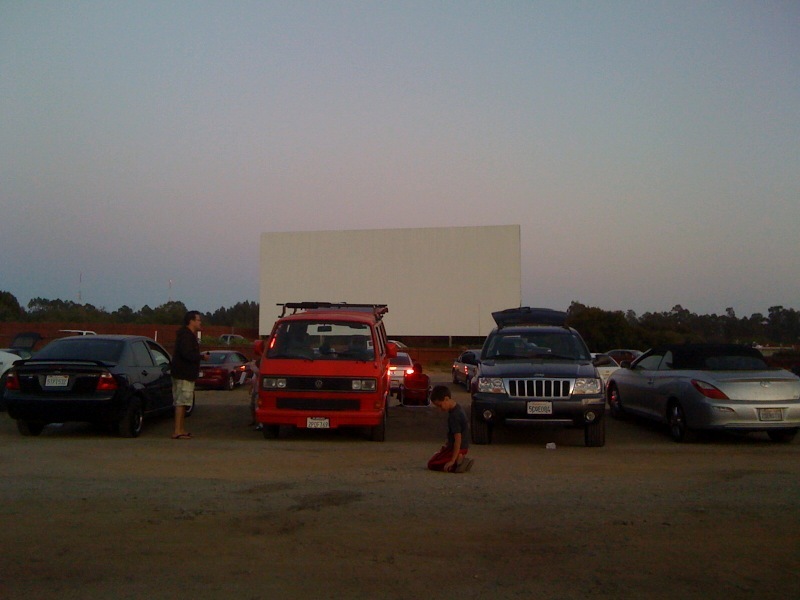 Rudy likes the drive-in scene! As the week progressed, we included Rudy in the projects as much as possible…he makes a great supervisor! 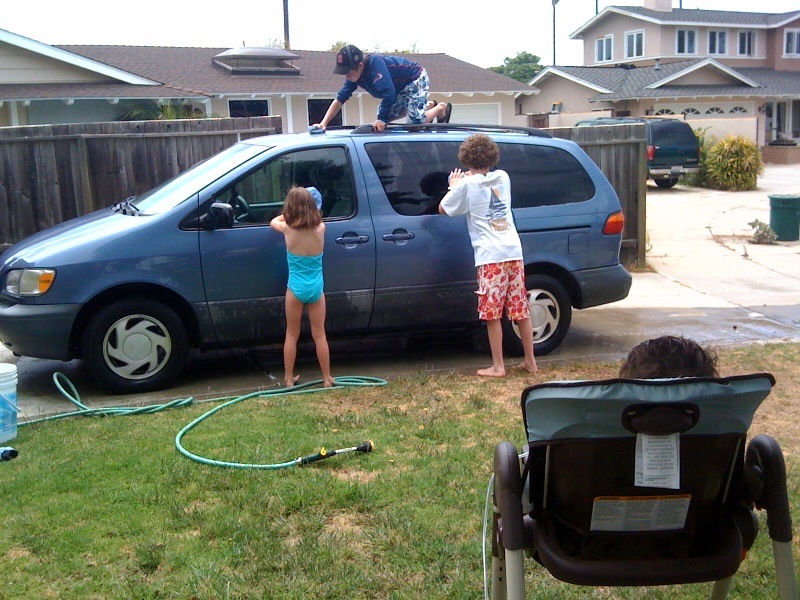 Shamefully, the family car hadn’t been washed in I don’t know how many weeks so washing the Sienna inside and out became one of the projects…I gave the kids the bin of car wash supplies and let them have at it! It was amazing…I came back a while later and it was all done AND done well! Rudy supervising the “chore” of the day! 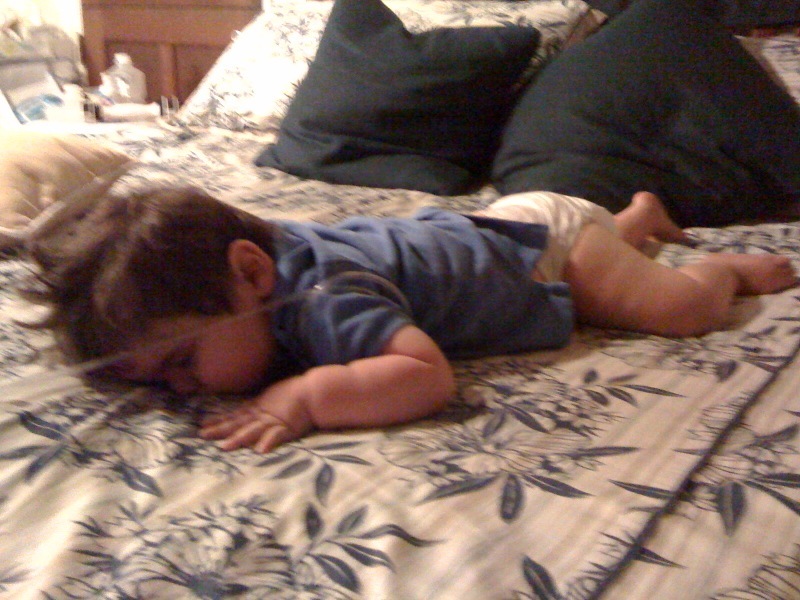 ...all this work makes me tired! Rudy continued his progress this week…for a little over a month, he has been rolling over from his tummy to his back and becoming quite the expert at it. He hasn’t, however, rolled from his back onto his tummy (not much motivation there, I guess) but he has been sleeping on his extreme side more and more. As he fell asleep earlier this week, he ended up making that final rotation onto his stomach and slept comfortably for 30 minutes until we transitioned him to his crib! Out of curiosity, Rolf checked his oxygen sats while he was asleep on his stomach and we were SHOCKED to see it register in the 90s!!! Something we’ve not seen before…’not quite sure what it means but we claimed it as a good sign! 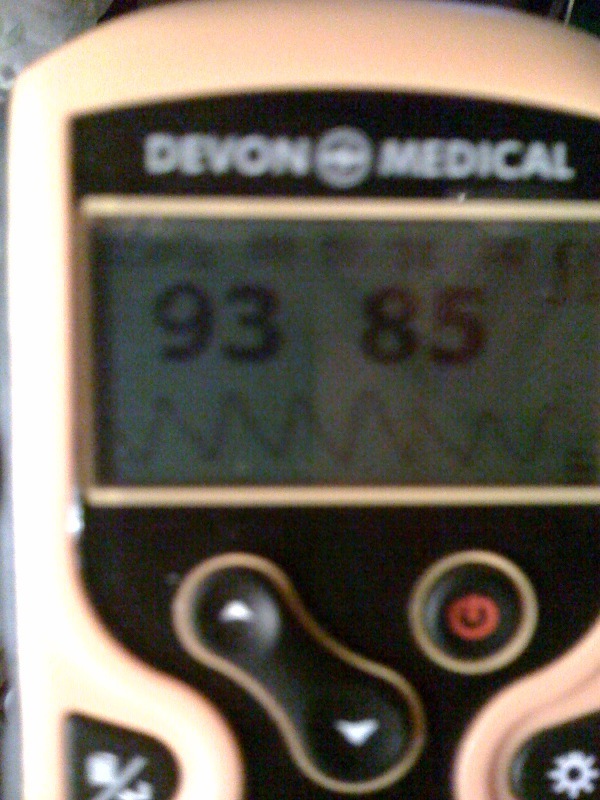 ...coincides with the first time his O2 sats EVER registered in the 90s...the low heart rate is his sleeping heart rate. 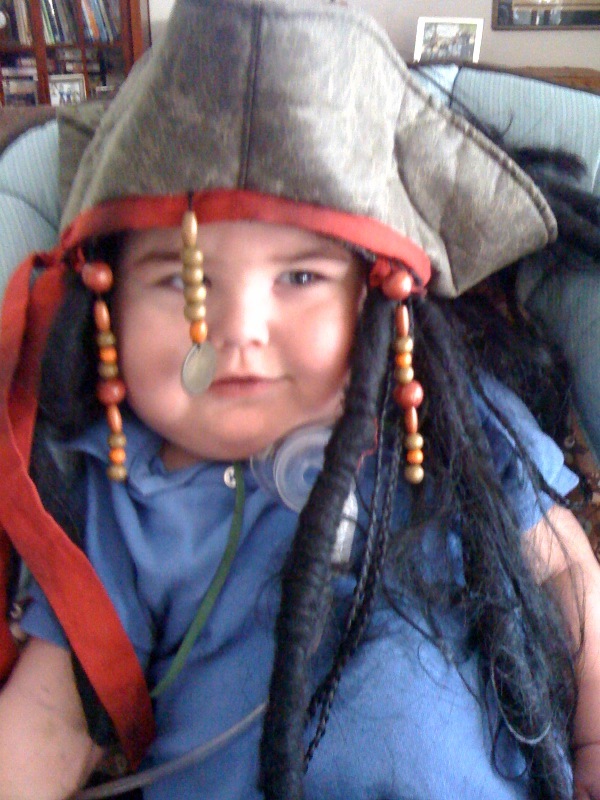 Nope, he can't quite pull off "pirate"!! 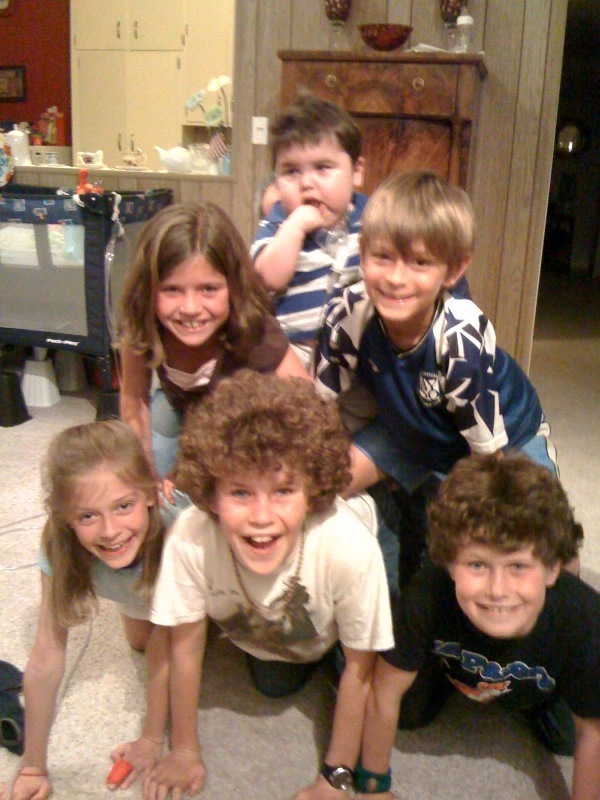 I treasured alot this week in the midst of the mundane acts of home management…especially watching the kids organize themselves and work together as a team, all the creative fun and Rudy’s smile as he watched and took it all in! Happy Weekend Everybody! 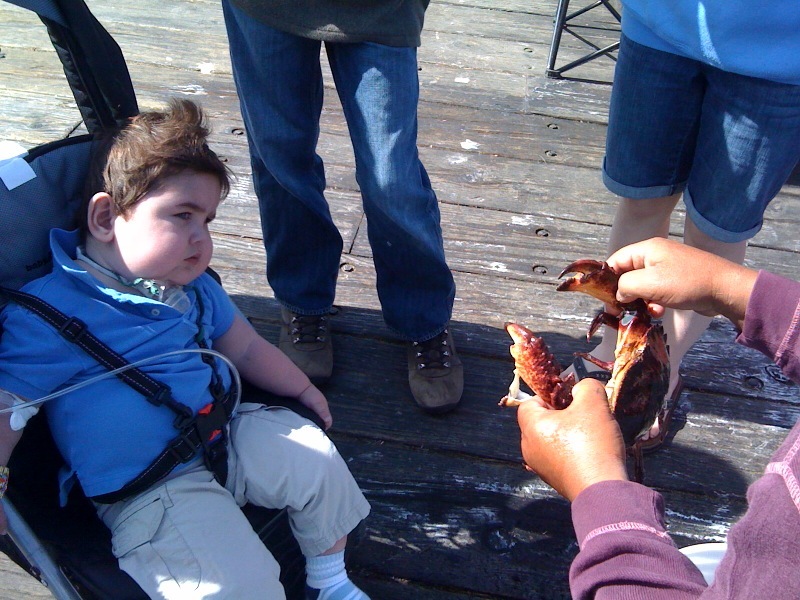 Rudy's encounter with a crab thanks to a local fisherman! 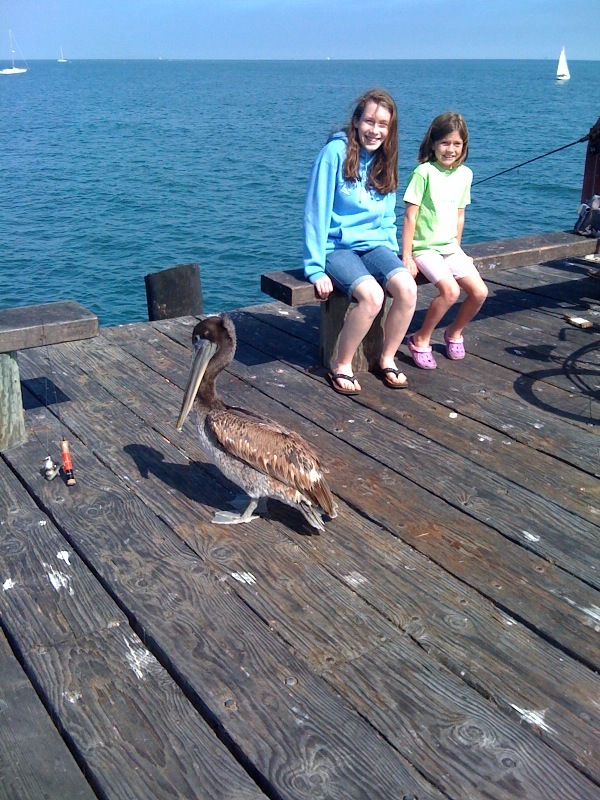 Rudy kept his distance from the pelican! In the midst of all the fun, Rudy had his monthly cardiology appt. with Dr. Harake last week as well. All remains stable with no real change in the heart’s condition! 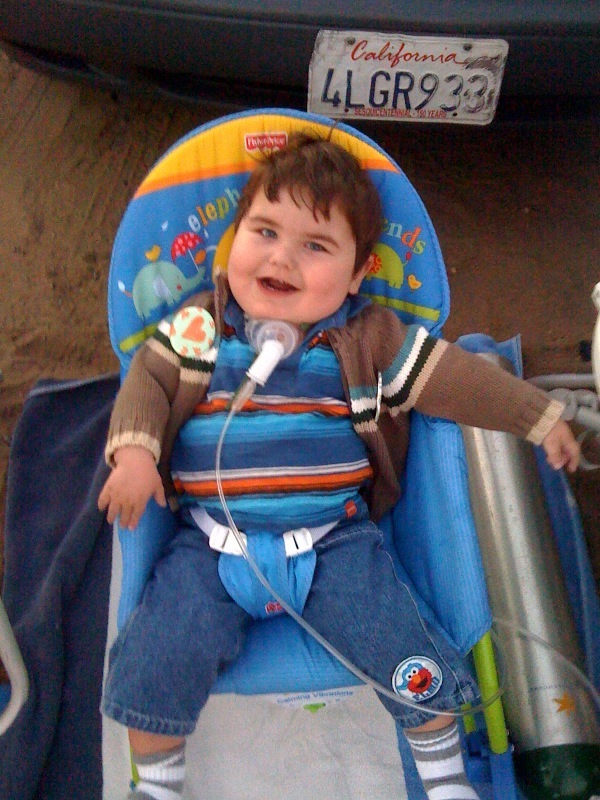 We are grateful as this means Rudy’s heart is continuing to give his lungs time to regenerate and heal. 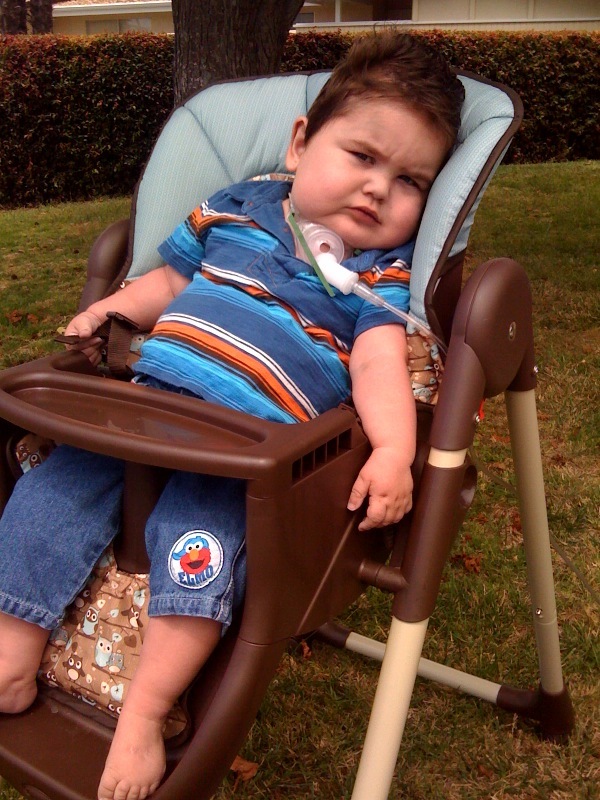 Because of a goodwill trip to Peru that a couple of Rudy’s doctors will be taking in late September, the plan is to schedule Rudy’s next heart cath/angioplasty in late October. This is GREAT news for Rolf as the Rescue Mission’s big annual fundraiser is going to be on October 2nd so any plan to proceed with Rudy’s heart surgery will be safely past this crucial event! Our next big appointment will be on June 29th with the pulmonologist at UCLA allowing us an opportunity to check in with the folks down south. 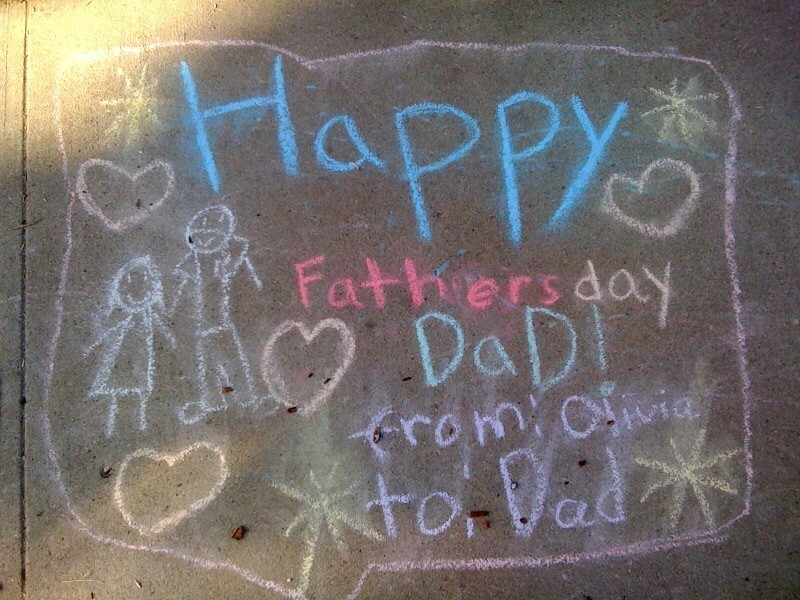 All is good and we continue to look forward to a (medically) uneventful summer!!! 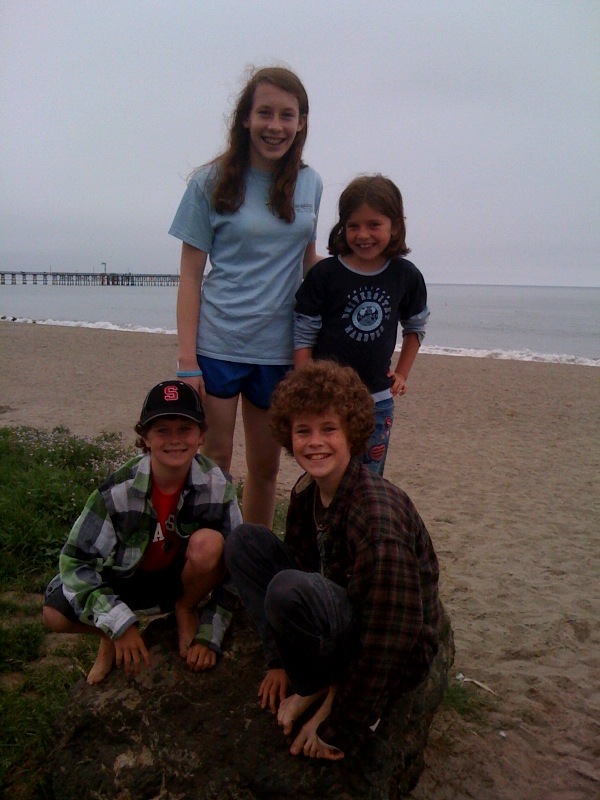 All three kids ended the school year with affirming words from their teachers and good marks on their report cards…another year under their belts and we’re so grateful for the supportive teachers with whom God surrounded them this year and the success they achieved with very little help from me and Rolf!! Oh well, we did manage to capture this little gem of a photo earlier this evening with friends Cady and Thomas so we did get to commemorate the day with a special pic! 20 months old today, Rudy,…Well done little man! 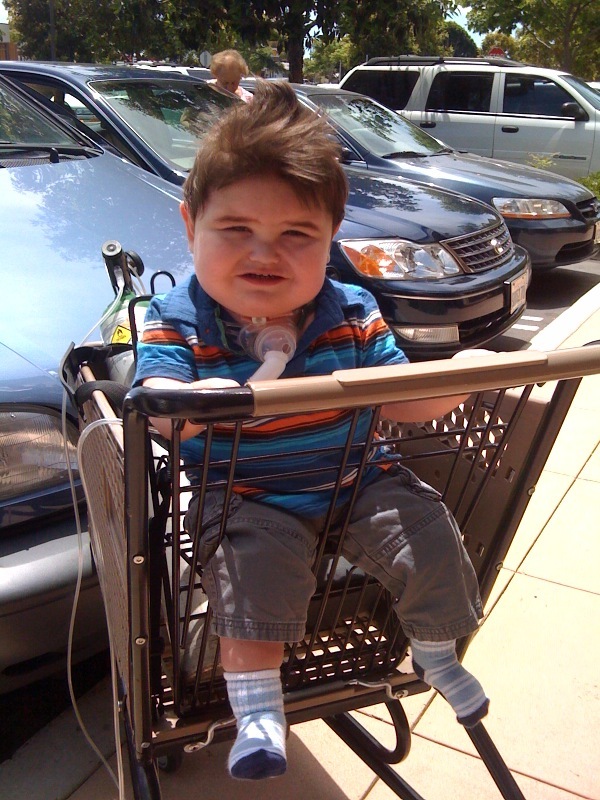 Rudy made progress in sitting over the long, holiday weekend…he tolerated sitting in a shopping cart for a quick trip through Michael’s and then again through Bed, Bath & Beyond. Earlier today he made it through a longer stretch during a Costco run! It’s a wobbly sitting session but he is learning to hold onto the bar in front and catch himself! Once again, well done little man! !